The fleece we breed to achieve. Blinded by the Light is exactly how we felt when we first parted her fleece. We are so excited to bring these genetics to the midwest. She has bright and dense fleece on a sturdy square frame. We love this little girl and she may just have the best personality on the farm. Friendly, curious, inquisitive, the kind of alpaca that makes you LOVE to raise alpacas. Her farm name is Calypso and she is backed up by a great pedigree. Her dam, Ishsha, is an El Nino grand-daughter with a single show entry earning her a blue ribbon. 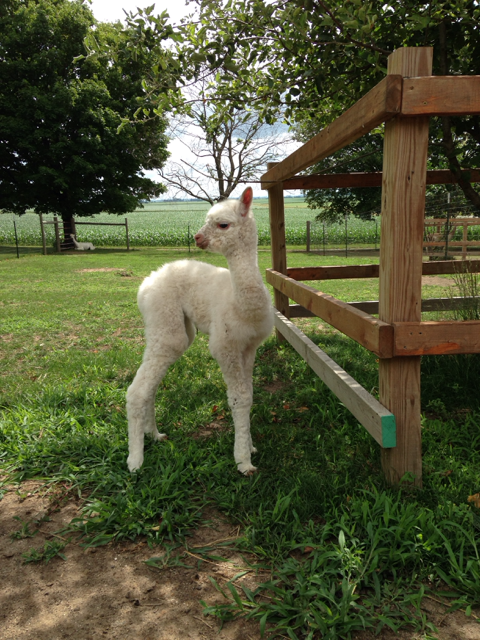 Calypso is the fourth cria of Ishsha, with all three previous crias also earning BLUE. With a track record like that, we’re quite pleased with this maternal line of animals.